You, as the property owner, are responsible for ensuring that our company is informed of any issues pertaining to the exterior surfaces to be cleaned prior to cleaning. Please do not keep any information from us that may pertain to the outside of your home. Things to mention are leaky windows, previous cleaning experiences, poor water drainage, any known damage, recent repairs, anything you have tried on your own, ect. What can I expect from power washing? Exterior power washing is the removal of build up dirt, debris, mold, mildew, tree dirt and environmental fumes on the surface of your home or walkways. Our job is to best remove this buildup without any damage to your home. Our process will leave the exterior bright and clean. We have been providing professional power washing since 2008, and we have no doubt you will be thrilled with our service! How clean will my windows be? We will do our best to rinse your windows but it is important to note that they will not be 100% clean and will require manual cleaning. If you wash your car and let it air dry, your windows will be spotted and streaked, same thing will happen to your homes windows. We will not start the cleaning of your home unless we have your full understanding of this. We can recommend a great window cleaner and you should budget for this if you do not plan on doing it yourself. Do you use pressure to clean my siding? No, we use a process called soft washing. Cleaning comes from our house soap that is the industry standard for cleaning. No pressure will be used on your home. Pressure will remove the chalking on your siding, leaving lines and marks, you do not want that! Our power washer is quite large, it runs at a far higher GPM then a power washer most home owners use allowing us to rinse incredibly well. The video will show you in more detail how soft washing works. We do use pressure on concrete, but even then we are using soaps in conjucntion with pressure. Chalking is a natural process your siding, aluminum trim, or painted surfaces goes through from constant exposure to the sun. Our process will not remove chalking. Think of it as a sunburn for your siding. Why are my gutters so dirty and can you get them back to new? Gutters or aluminum trim is made of painted aluminum, which naturally attracts dirt through a bonding process. We have a special cleaner that addresses this. As aluminum ages though, it loses its shiny painted coating, much like a cars paint dulls over time. Once it has lost this, removing the gray dirt becomes much more difficult or impossible. Excessive dirt on gutters may involve a separate charge. - Click picture to see before and after! 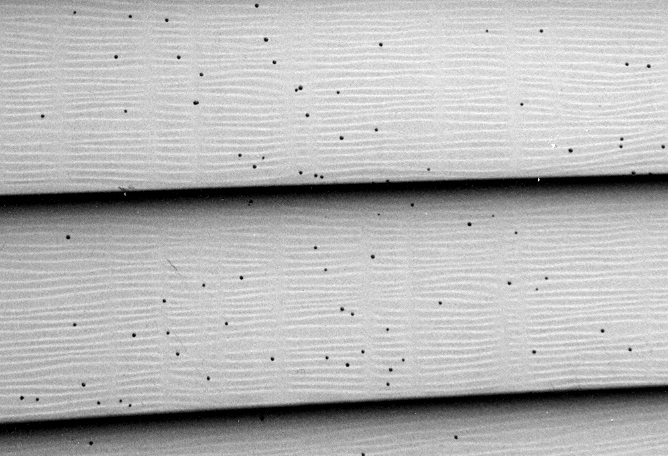 What are the black dots on my siding near my mulch bed? This is called artillery fungus, or shotgun fungus, and is a wood-decay fungus that likes to live on moist landscape mulch. These spores can shot up 20 feet, making them very frustrating. Unfortunate no mulch can resist these spores, and in fact Penn States Pathology department tested 27 different mulches and found non of them fought these spores. Getting ride of them isn't an easy process. Power Washing will not remove these spots and scraping off each one is very time consuming. Refreshing the mulch every year would be the best option to help prevent these spores.